1st April, 1954 the parts of Bilaspur were also merged with Himachal Pradesh having its Headquarters at Shimla. The head was the Chief Commissioner. The first Chief Commissioner was Mr. N. C. Mehta and he was assisted by his deputy Mr. E. Penderal Moon, ICS. On September 30, 1948, an advisory council was formed for the advice of the Chief Commissioner for administrative functions. The Central Government promulgated the Himachal Pradesh (Courts) Order, 1948 on 15th August, 1948. As per Paragraph 3 of this Order, the Court of Judicial Commissioner was established for Himachal Pradesh and the Court was housed at "Harvingtan" (Kelston area, Bharari, Shimla). It was vested with the powers of a High Court under the Judicial Commissioner's Court Act, 1950 besides the Court of Judicial Commissioner, two Courts of District and Sessions Judges and 27 subordinate Courts. The Court of Judicial commissioner started functioning on August 15, 1948 and in the same year, two Courts of District and Sessions Judges were also established. The Punjab High Court rules and orders with suitable amendments were made applicable. On April 29, 1967 two more District and Sessions Judges Courts, one for Shimla and other for Kangra were established. However in the year 1966, the Delhi High Court Act was enacted by the Government of India and w.e.f. 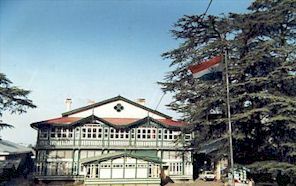 May 1, 1967, the Central Government of India extended jurisdiction of the said Act to the Union Territory of Himachal Pradesh, replacing the Court of Judicial Commissioner by the Himachal Bench of Delhi High Court, at Shimla and it started functioning in old High Court building known as "Revenswood". The Court of Judicial commissioner stood abolished with effect from 1st May, 1967 and instead the jurisdiction of the High Court of Delhi was extended to Union Territory of Himachal Pradesh under the Delhi High Court Act, 1966. At that time, Hon'ble Mr. Justice K. S. Hegde was the Chief Justice of the Delhi High Court. Hon'ble Mr. Justice S. K. Kapoor and Hon'ble Mr. Justice Hardayal Hardy constituted the first circuit bench of the Delhi High Court which held Court at Shimla in the building "Ravenswood". The State of Himachal Pradesh attained the Statehood in the year 1971, and established its own High Court with Headquarters at "Revenswood" Shimla, having one Hon'ble Chief Justice and two Hon'ble Judges. The first Chief Justice of the High Court of Himachal Pradesh was Hon'ble Mr. Justice M. H. Beg and the other two Hon'ble Judges were Hon'ble Mr. Justice D. B. Lal and Hon'ble Mr. Justice C. R. Thakur.